One of latest (e)mail messages I received was from the MD with whom I had a telephone appointment and received an Rx for eye drops for me. Just recently, my daughter was down with a sinus infection that took her out of commission for about a week and a half. She had an in person MD visit and a telephone visit. I really came to appreciate the telephone visits because it saves the time of having to drive to a doctor. I morphed into my maternal role of cooking soups of chicken and minestrone but her taste buds were not up to appreciating my efforts. At least that is what I am telling myself not wanting to accept that my cooking is bad. The illness kept my daughter from wanting to cook anything and I have missed her contributions to our bill of fare. Now I am a bit under the weather with an eye infection and she is getting back to normal and appreciates feeling better. So she made dinner for us which was great. I really am not into cooking the daily dinners any more and really love that she likes to cook and does not mind pitching in with menu suggestions, cooking, and shopping with me. I am grateful too for easy to put together items from the local groceries and restaurants that deliver. In the meantime, Spring has sprung in my backyard. Stream of Consciousness Saturday, #SOCS, is hosted by Linda G Hill. Today’s prompt: “the last piece of mail you received.” Talk about the subject of the last piece of physical mail you received, i.e. a gas bill–talk about gas, not the bill itself. Have fun! This entry was posted in Blogging, Blogging Community, Food and Family, My Life and tagged SOCS, Stream of Consciousness Saturday on March 23, 2019 by Deborah Drucker. 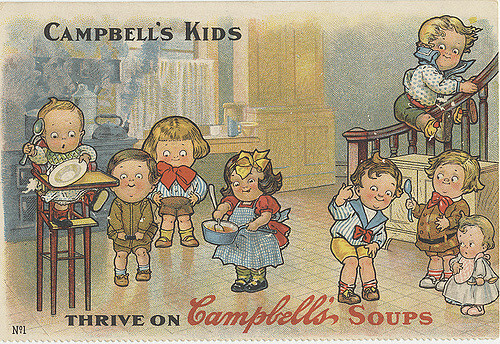 When I was growing up we ate Campbell’s Soup. My father said my younger brother and I looked like the Campbell’s Soup Kids. 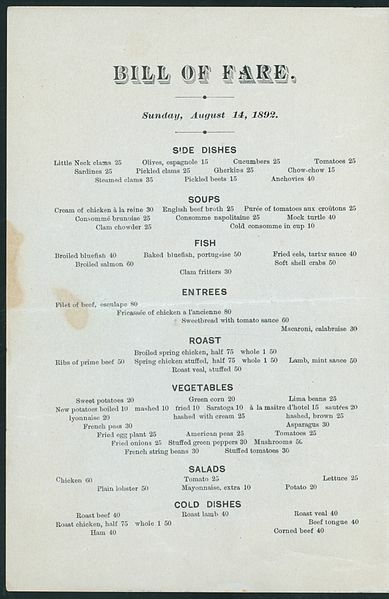 One of their soups I liked was Cream of Celery. There are recipes online for making fresh Cream of Celery Soup and other cream of, (some type of vegetable), soups. They look and sound good, especially for cold winter days. Do you have a favorite? My daughter bought the ingredients to make cream of fennel soup. I’m getting hungry. Stream of Consciousness Saturday, #SOCS, is hosted by Linda G Hill. The prompt for today is ‘cele’, use as part of word. This entry was posted in Blogging, Blogging Community, Food and Family and tagged #Stream of Consciousness Saturday, SOCS on March 2, 2019 by Deborah Drucker. My writing has been suffering because I am engrossed in genealogical research. After researching my family tree, I feel like Bilbo Baggins at his 111th birthday surrounded by his extended family and calling out their names, Bolgers, Tooks, Bracegirdles, Proudfoots, and all the rest. I don’t think any of my relations have hairy feet, but it will probably take me until my 111th to finish with the tree. Everytime I think I am coming to the end I find just a bit more. I imagine a reunion with all the different family names. I don’t think there are any Bracegirdles however, but you never know. This reminds me of me shut away in my retreat searching for ancestors on my computer. This entry was posted in Blogging, Blogging Community, Food and Family, My Life and tagged #Ancestors, Stream of Consciousness Saturday on December 15, 2018 by Deborah Drucker. Yule starts with the winter solstice, the longest night of the year. For many of us it is time to gather for holiday celebrations. We just celebrated Hanukkah last week with part of the family. The best gatherings are with family and close friends. We might enjoy some eggnog or mulled wine and special meals like roast turkey. My daughter wants to make something different, paella. I look forward to being together with my daughter and my son and his family. Have a cold this week and grateful for online shopping. My little grandson is sick and had to go into the hospital yesterday. He is doing better and should be home soon. It has been a tough year for many people with all the hurricanes, floods, earthquakes, and wild fires. I hope everyone can be with their families and friends and have Happy Holidays! Wassail pronounced like waffle but with /s/ sound can mean drinking to your health, like a special holiday punch, or caroling ( singing Christmas songs). Here’s to all of our good health and Happy New Year! Stream of Consciousness Saturday is hosted by Linda G Hill. The prompt words for today are you’ll, Yule, Yul. Featured image of ‘Snowing Snow Lantern Red Little Girl Winter’ via Max Pixel. This entry was posted in Blogging, Blogging Community, Food and Family, My Life and tagged #Stream of Consciousness Saturday, #Yule, Happy Holidays on December 22, 2017 by Deborah Drucker. My mother in law was married on November 24, 1948. She did not know that her first daughter in law was being born a little over a week later. We did not meet each other for another 26 years. My future husband had talked me into driving down to Los Angeles with him after we had a big fight. She did not like me at first. He was her first-born and she was definitely not ready to relinquish him. I was the wrong religion. I would marry her son 3 years later. My mother in law had 4 sons and was used to a house full of males. It was a nice change to have me at the dinner table because I was appreciative of her cooking. She was my mother in law for forty years. She taught me how to make chicken soup. She helped me shop for my wedding gown and plan my wedding. I was her first daughter in law and I gave birth to her first grandchild, my son Scott. She first learned about being a mother in law with me. It was not always an easy relationship. Especially after my son was born and 4 years later my daughter, Kate. She had very strong opinions about many things including child rearing. I had my own ideas. As the years passed she became less critical and I became less sensitive. I suspected it might have been her experience with the next two daughter in-laws had taught her to be more diplomatic. Through it all, the holiday dinners, kid’s birthday parties, graduations, and major illnesses, my in-laws were always there. Both of my parents were gone and my children had only one set of grandparents, one grandmother. In her later years she developed dementia and gradually became less talkative. I think she still recognized me. She had often said she thought of me as the daughter she never had. My mother in law, Mary Lynn, passed away in the first hour of Thanksgiving day with most of her family around her. For a large part of my life she was the mother I never had. One Liner Wednesday is hosted by Linda G Hill. Featured image is of the ‘Barbara Bush Rose’ via wikimedia. This entry was posted in Blogging, Food and Family, My Life, Quotes, Writing and tagged #1linerweds, #Daughters in law, #Mothers in law on November 29, 2017 by Deborah Drucker. In prior years I have prepared an entire traditional American Thanksgiving dinner by myself. In more recent times it is a team effort of my husband, daughter and me. Our son is married and usually does not get involved in our preparations. This year we will be preparing the stuffed turkey and fresh cranberry sauce to take over to my daughter-in-laws parent’s house. My husband is happy as long I am making the turkey and the stuffing. The quote about Thanksgiving dinners rings true to me. I can remember cooking all day having my senses overloaded with all the aromas, then we would sit down and gobble up everything in minutes. I would think to myself All that work and it is over so fast! This entry was posted in Blogging, Blogging Community, Food and Family, My Life, Quotes and tagged #1linerweds, Thanksgiving dinner on November 22, 2017 by Deborah Drucker. This entry was posted in Blogging, Food and Family, My Life on September 24, 2017 by Deborah Drucker.